Nancy is making some changes at her store so keep your eyes open for Creative Cutz getting even better! How can it get any better with her files just being 99₵? We’ll have to wait and see…. 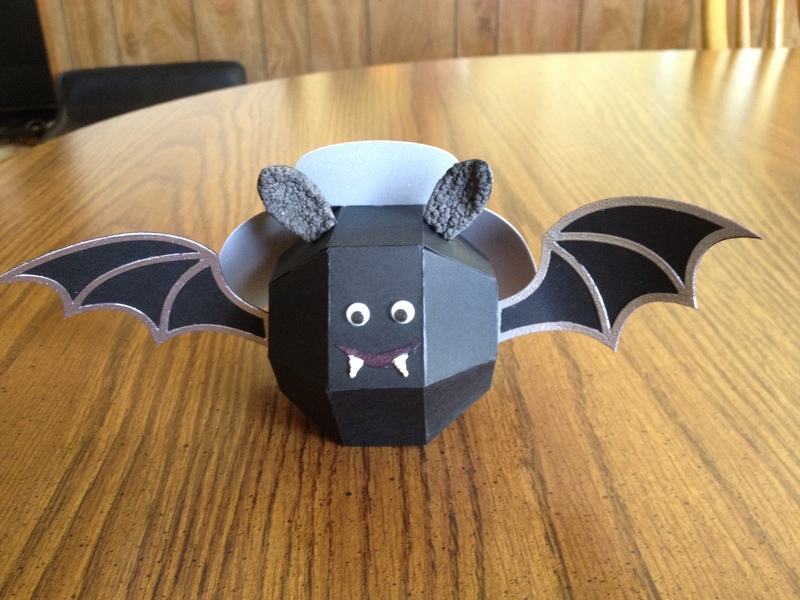 Have you see her newest file the vampire bat? It is a treat holder too! How clever! Nancy discovered scrapbooking about 15 years ago when card stock and stickers were just about the only supplies available. She eventually combined her love of preserving memories in scrapbooks with her graphical design experience and began designing digital scrapbooking products. A few years ago she attended her first stamping party and a new passion for cardmaking was born, along with the need for a LOT more storage space. 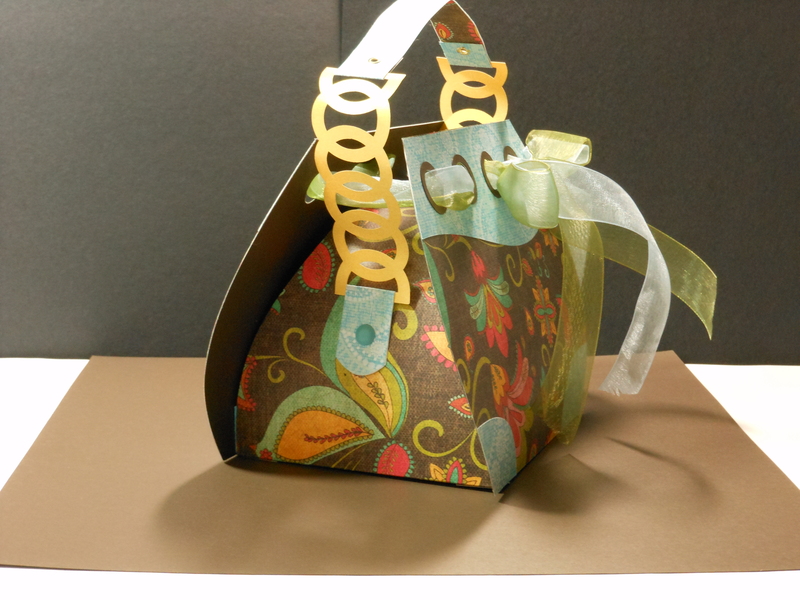 Add to that a cutter and Make-the-Cut, and Cre8ive Cutz came to life. Nancy gets inspiration from just about everywhere; her family is used to having to wait while she stops in a store to snap a picture of a cool color scheme or pattern. 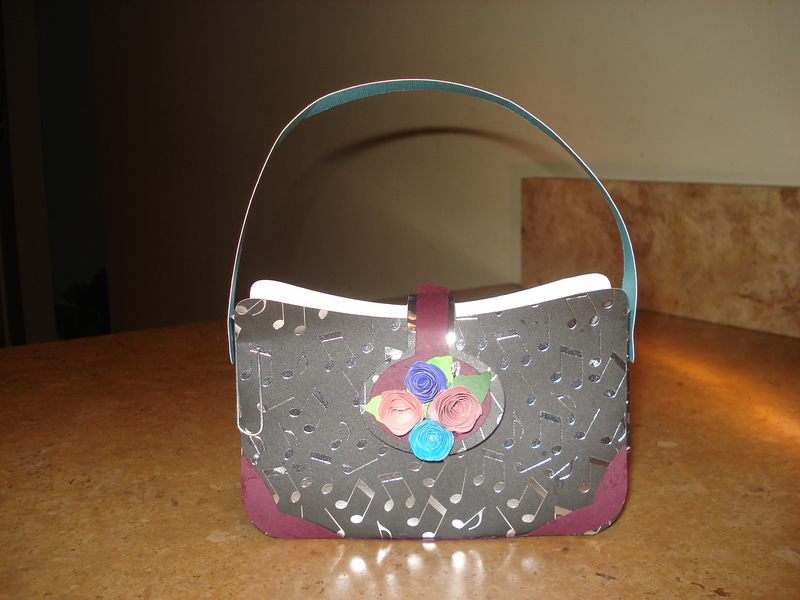 She especially loves the challenge of figuring out how to create paper versions of the things we use every day, like our purses. Nancy lives in Calgary, Alberta with her husband and teenage daughter, as well as two four-legged furry children who love helping her craft, especially when there's ribbon or twine involved. 2. You must use Make-the-Cut. Try to aim for a Fall or Halloween theme. 3. You can enter up to twice with two unique projects (not just different paper). 4. Do NOT post any adaption of her files on the forum. 5 The challenge ends Sept. 16. 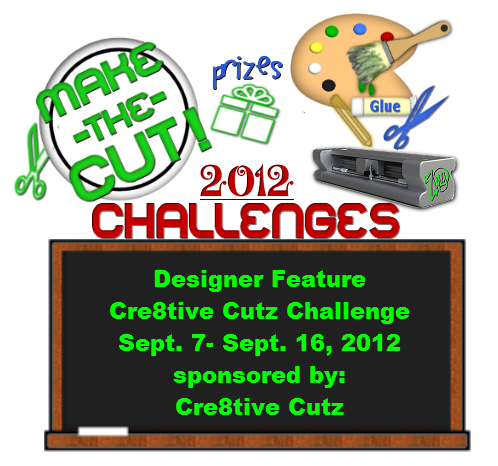 The winner selected by random number draw wins a $10 gift card to Cre8tive Cutz. So glad you're playing Brianna, I'm looking forward to seeing what you create! I love your files and have used alot of them for my daughter in laws shower. I hope i can find the time with wedding in 3 weeks to join in the fun! Woo hoo! Thanks for sponsoring, Nancy! This challenge came at an opportune time for me! After learning about Jillee's website (thanks to a forum member) about making homemade laundry soap I also found Jillee's "recipe" for a homemade car deodorizer. I was mulling over possible things to cut from felt and fun foam when the new challenge was posted. So here is my entry! I have not yet found the perfect settings on the Zing to cut the foam and felt. In fact, since I didn't have self-stick felt I decided to cut the felt by hand. Think the self adhesive felt would be easier to cut with a cutter. Now I need to find some scented oil such as spice, clove, etc. to use on my little punkin. I think @Nelda has cut craft foam so I bet she could shed some light on settings. Hate to be so dumb but what does rule #4 mean? Love your project @daffeydil, what a cute idea! Thanks Nancy for the challenge. Here is my take on your Vimpire Bat Candy Box. I need to find a better way to take pictures of my pieces. This was fun to make. Plan on giving the box to our 6 year old Great Grandson. He saw me working on it yesterday and wanted it. It will make his day when I give it to him next week. Super cute @Penny, and I love those ears! What did you use for the texture? Thanks @Nancy_Cre8iveCutz. I used Black Liquid Applique for his ears (did 2 coats). I also used white applique on his teeth. This box went together so easy. Very nice file from Nancy's shop. I cut the thinner craft foam last winter just after I got the Zing. I do not remember the settings but I thought that I had posted them here. I do think I did a double cut. I'll try to do a search (if my connection stays open). BTW, I am having internet trouble - I think I have a bad power supply so I ordered another one. I keep loosing connection and notice that my router is restarting. So I may be off foe a while until this gets fixed. @daffeydil I just love this idea! What a neat stocking stuffer idea. Yes, I am in Christmas mode. @Penny I adore your little bat. Great job! @Nancy_Cre8iveCutz Hope toplay along if time allows and I can decide which of your fantastic patterns to purchase! Would love to have you visit me at: rhapsodyonpaper.blogspot.com for Crafty Gal Corner Challenges Projects and http://www.havecolorsbehappy.blogspot.com/ for ScrappyDew Design Team Creations. Happily using Make The Cut with 'Zenith' ZING for over 5 years!!! 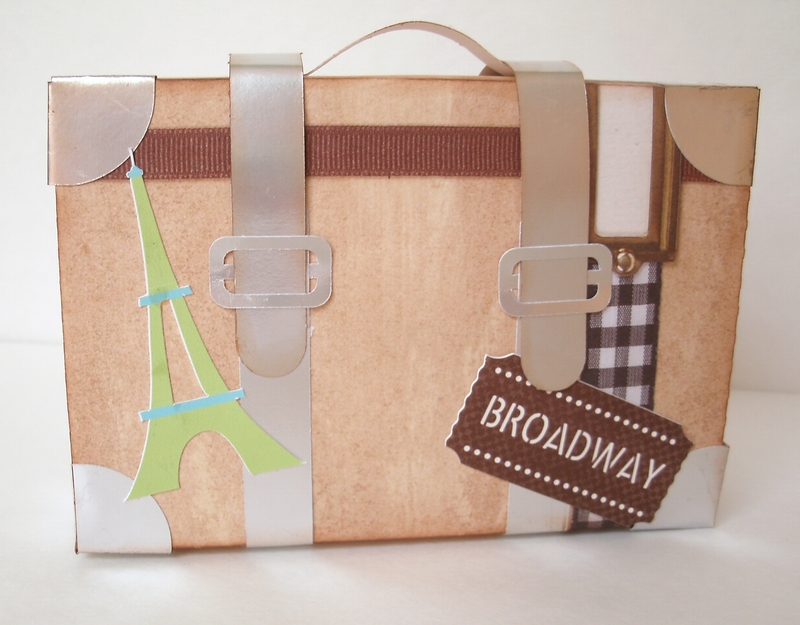 @ImaCutter such a cute take on the suitcase! @Jana I hope you can play along! @ImaCutter What a great suitcase. This would be a great bon voyage gift! Nicely done! I didn't think I was going to be able to do this challenge because my Zing is doing funny cuts, but then I remembered that I had done up this card last week and just hadn't put it together! Yea! I used a big button in the middle. This is one of Nancy's free files. 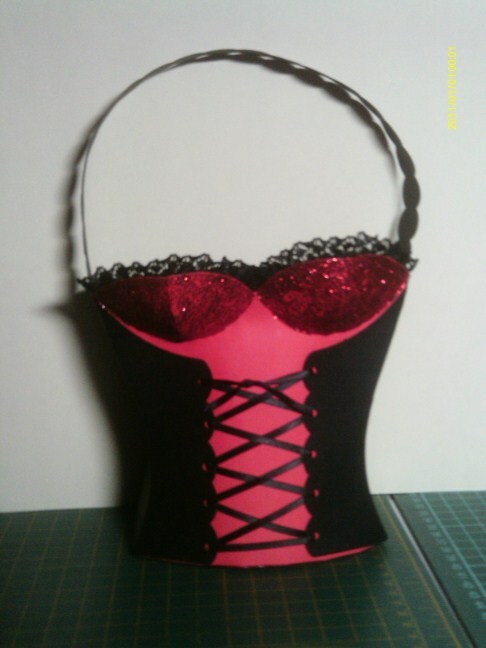 I was hoping to get the bustier one done but like I said my Zing is sick....this will have to do!! here is my entry in my first challenge....this is sooo much fun!!! @Rosie0530 this is just uber cute! Nice job. @brianna_c1 Oh that turned out so nice. I still can't believe Nancy was able to make the bustier purse file!! It is so cool! I bought it but haven't had the opportunity to make it yet. Great projects! Also remember you can enter up to twice! I hope we get lots of entries. Here is mine! Nancy does have great files, easy to work with. PS. Did you see the new file I just added to the store? 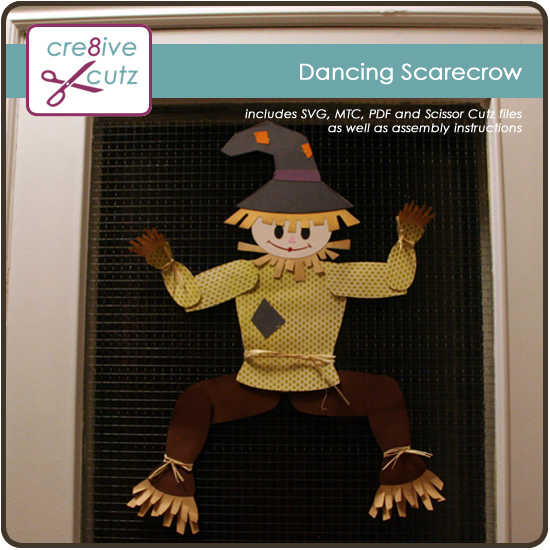 It's a Dancing Scarecrow and he's so cute! 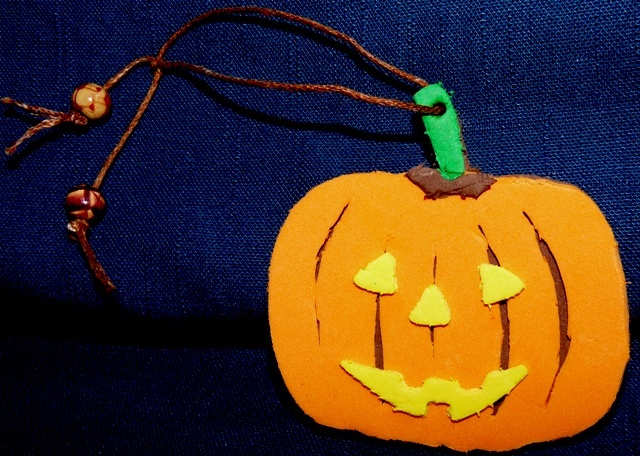 (and is perfect for the Fall / Halloween theme too!) The pic is a link to the store where you can check out more pics. 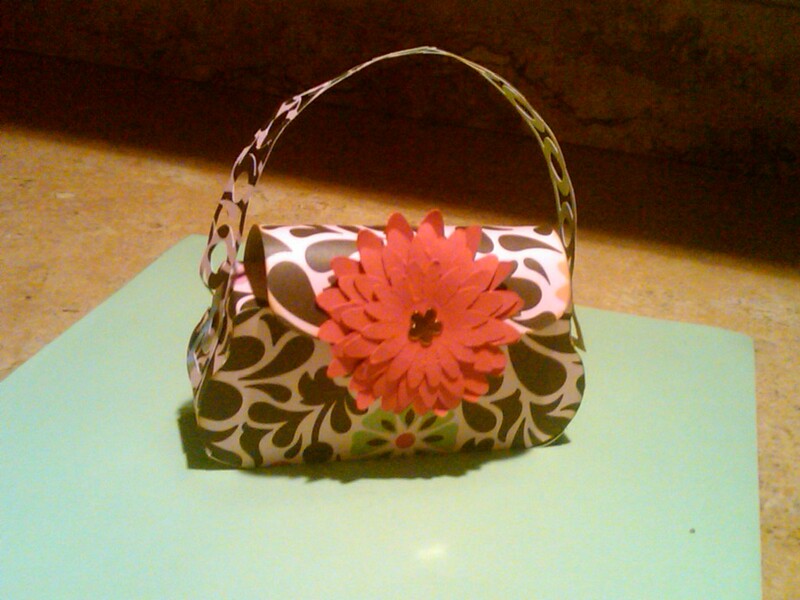 @missmay what an adorable purse. Love the colors. Hi @Jana, they should be showing up in the pattern, are you using the MTC version? @Nancy_Cre8iveCutz Oh bother, silly me, using the svg file. Let me go use the mtc file. Still new to this so bear with me.....Yeppers using the wrong file. Thanks you again Nancy! You're the greatest!!!!! Thanks go to @Nancy_Cre8iveCutz for the help in my original blunder. 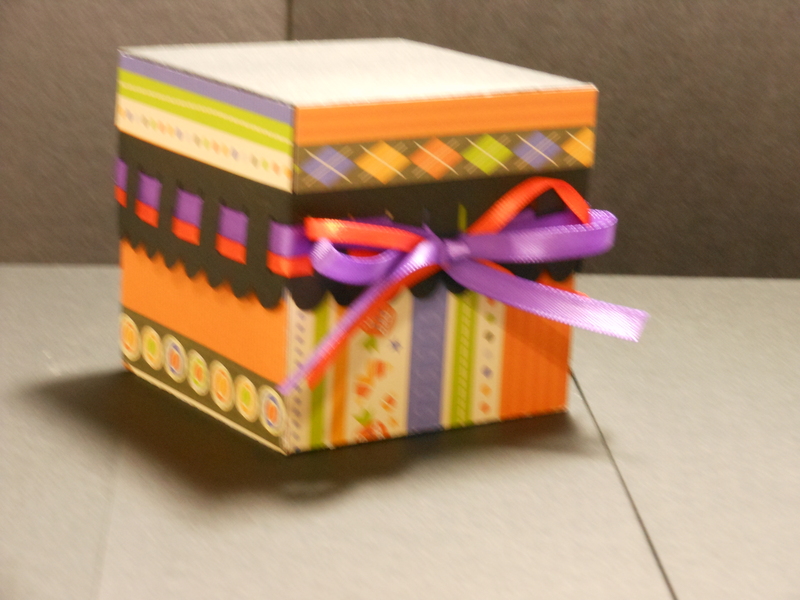 I have made the ribbon box to hold one of the birthday presents for my daughters birthday Oct. 5th. This file was a dream to cut and put together! The paper is from the 2011 Halloween and Fall big paper book by DCWV. 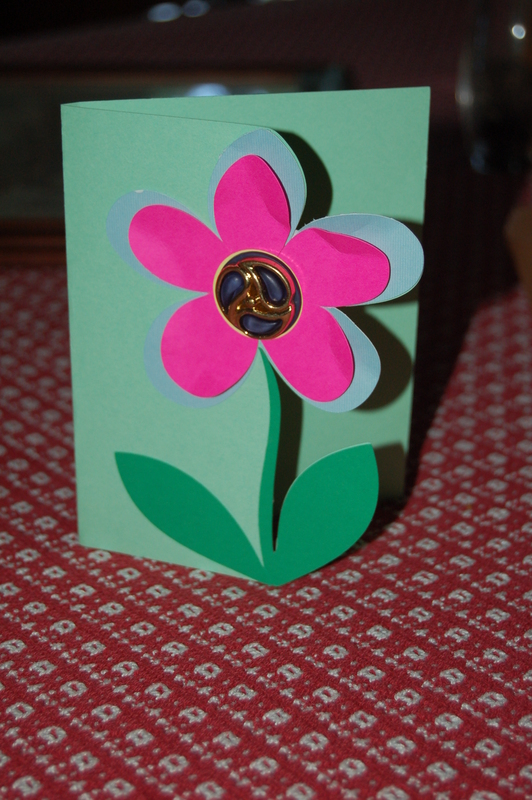 I did glue the paper onto card stock to make it heavier. Now on to project two. I love my Zenith Zing, MTC and this forum!!!! This is one of my favorite files. Nancy shared sometime ago. I use it often, it is so easy ! My grandaughter (7) helped with this one. She was the "chooser" (so she said) she picked out the papers and embelishments. This file she can assemble with little help. Oh, she is convinced she can now use Make The Cut and the cutter by herself (truth is she probably can), If I wasn't concerned about what might be deleted by mistake. She shares my love of crafting, so I'm thrilled to have her for a crafting buddy. I love all the projects that have been posted so far. I HAVE to go grab the scarecrow - I know exactly where he is going, too! It will be a rush to get him done today, but I am going to try! Here he is! This is just a picture of the project - I will take one tomorrow at work to show him in place. I love this file, he was resized quite a bit smaller, still, he is just over 16" tall. This was close, whew! 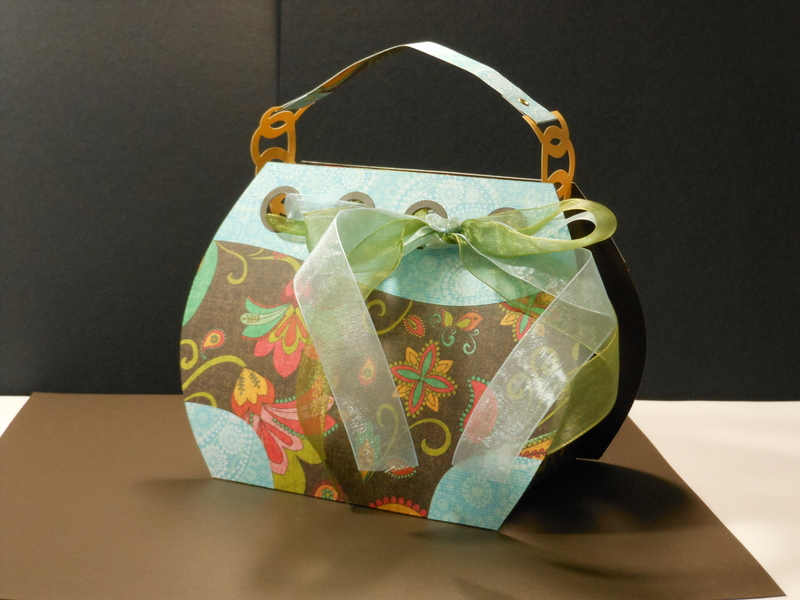 Here is the single cupcake purse. I don't think it will be for a cupcake, maybe a pen holder if I can find a container to fit the circle. Again, thanks to the challenge committee and to Nancy for the great files. 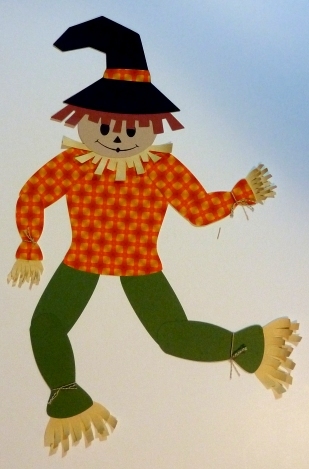 @reba1 your scarecrow is darling, where is he going to be? 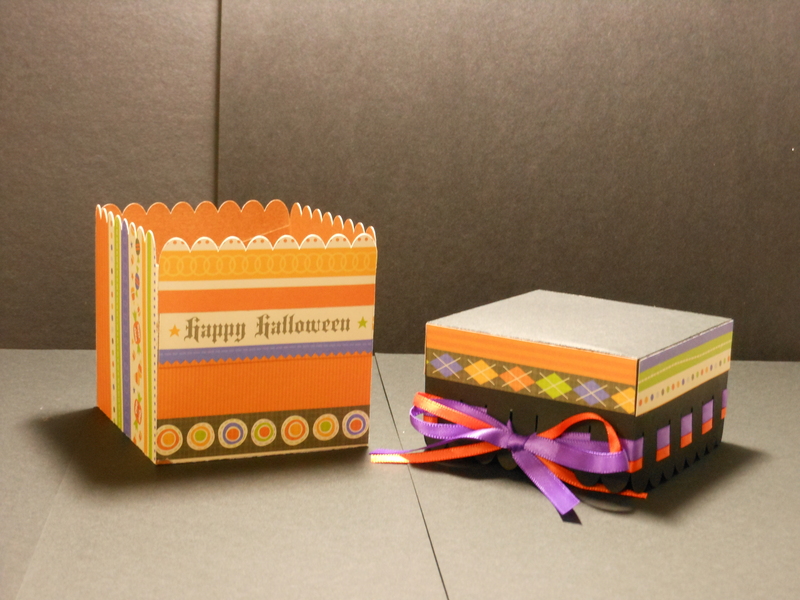 @Jana I'm glad you got the ribbon box file figured out, it's so cute with the Halloween papers. And your cupcake purse turned out great too. Linda - I included you in the drawing even though your pic did not load. Awesome! Nancy has such great files! Thanks to all who joined in the fun!! Congratulations ImaCutter! All the projects were terrific! Great job everyone! It really is a huge thank you to Nancy at Cre8tive Cutz for sharing her talents with us!! Congrats to ImaCutter and a big thanks to Nancy and to the Challenge Committee. Thanks to everyone who played, I really enjoyed seeing all of your creations! 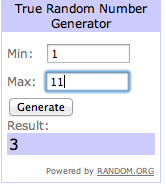 And congratulations to @ImaCutter, I've pm'd you about your prize. All great projects! The scarecrow is my fav. If I had somewhere to display him, I'd make one.